Another great recipe from Miette cookbook, authored by Meg Ray with Leslie Jonath. Sift together both flours, the salt, and cinnamon into a bowl. Set aside. In the bowl of a stand mixer fitted with paddle attachment, combine the butter, brown sugar and honey and beat until fluffy, about 5 minutes. Add the dry ingredients to the butter mixture in three additions, beating just until combined after each addition. Wrap the dough tightly in plastic wrap and refrigerate for at least 30 minutes before rolling, or for up to 2 days. Preheat the oven to 350 degrees F. Line a large baking sheet with parchment paper. Unwrap the dough and place between two sheets of waxed paper. On a clean work surface, roll out to the thickness of about 1/4 inch. 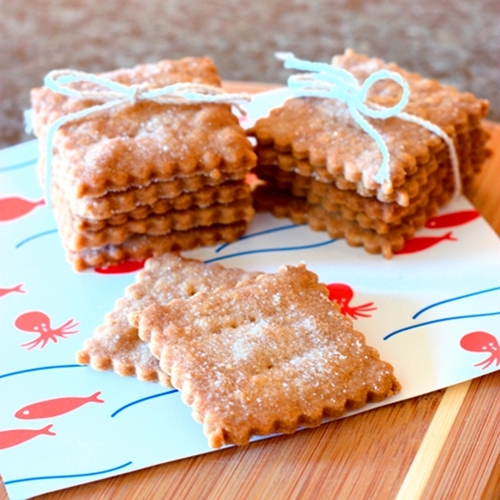 Using a cookie cutter, cut out the crackers. Arrange on the prepared baking sheet, placing the cookies about 1/2 inch apart. Bake until golden brown, 10 to 12 minutes. Transfer to the wire rack and let cool completely. They should snap crisply when cooled. Gather up the dough scraps, re-roll, and cut out to make more cookies. Bake as directed and let cool. Store in airtight container for up to 2 weeks. Very cool! These would be great for completely home made s'mores!